CALIFORNIA 50 • SHOPPING CENTER BUSINESS • September 2018 platform by 10 percent. This has led Lefko to surmise that a stronger marriage be- tween online and brick and mortar will result in a happier family for all. "There is a direct correlation between the number of omnichannels a retailer implements and the increase in sales," he says. "During the 2017 holiday season, desktop computer shopping outpaced mobile device shopping by almost three times, but the significant statistic is that retailers who had a shopping platform for desktop computers, smartphones, and brick-and-mortar saw a 3 percent increase in the volume of sales per transaction." This marriage has also, naturally, brought e-commerce-only retailers into today's hottest shopping centers. "Tenants that lack an online presence and those that are slow to adapt effec- tive e-commerce strategies will continue to see their sales decline in the near fu- ture," says Bryan Ley, managing director in HFF's Los Angeles office. "On the flip side, e-commerce retailers have to have an offline presence, because shipping costs and e-commerce advertising make it ex- pensive, and a brick-and-mortar presence is an easier and more cost-effective cus- tomer connection." Ley cites Amazon Bookstores, Amazon Go, Warby Parker and a variety of cosmet- ics brands as prime examples of the allure brick-and-mortar can have on web-based companies. Technology is not all sunshine and ros- es, however. The downside to these inno- vations is that many retailers now require less merchandise and, therefore, space in shopping centers. The barrage of start-ups and e-commerce companies now rolling out their first few stores have also made lease negotiations tricky at best. "Landlords are having to figure out challenges, such as how to approach percentage rent when people are showing up at stores simply to show- room or make returns," Thompson says. "As yet, there are no easy an- swers to these issues." One seemingly "easy answer" that Lew- is has found is this: embrace change, give people what they want and design for to- morrow today. "Our new centers are focused on the experiential tenants most sought after today," he explains. 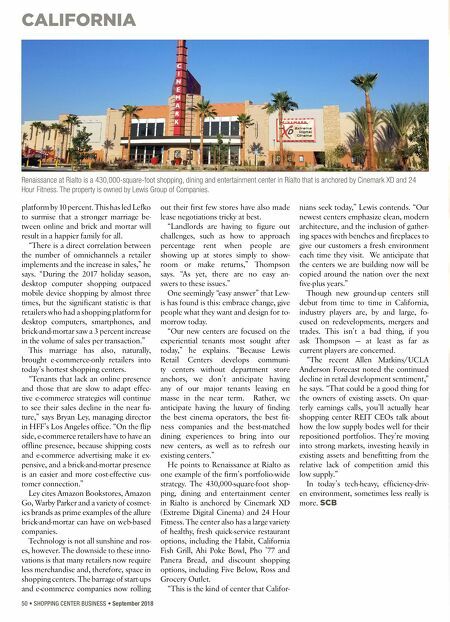 "Because Lewis Retail Centers develops communi- ty centers without department store anchors, we don't anticipate having any of our major tenants leaving en masse in the near term. Rather, we anticipate having the luxury of finding the best cinema operators, the best fit- ness companies and the best-matched dining experiences to bring into our new centers, as well as to refresh our existing centers." He points to Renaissance at Rialto as one example of the firm's portfolio-wide strategy. 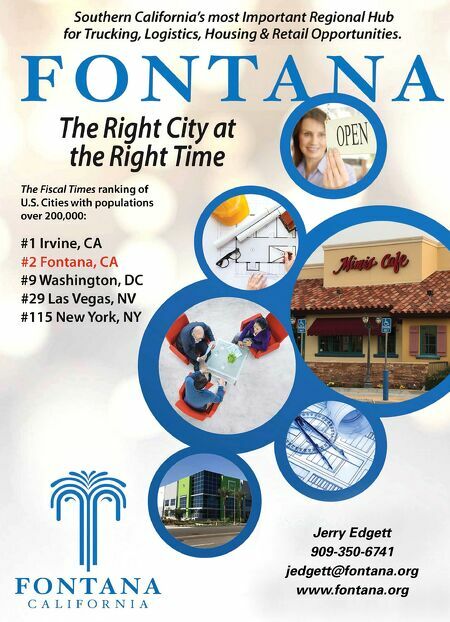 The 430,000-square-foot shop- ping, dining and entertainment center in Rialto is anchored by Cinemark XD (Extreme Digital Cinema) and 24 Hour Fitness. The center also has a large variety of healthy, fresh quick-service restaurant options, including the Habit, California Fish Grill, Ahi Poke Bowl, Pho '77 and Panera Bread, and discount shopping options, including Five Below, Ross and Grocery Outlet. "This is the kind of center that Califor- nians seek today," Lewis contends. "Our newest centers emphasize clean, modern architecture, and the inclusion of gather- ing spaces with benches and fireplaces to give our customers a fresh environment each time they visit. We anticipate that the centers we are building now will be copied around the nation over the next five-plus years." Though new ground-up centers still debut from time to time in California, industry players are, by and large, fo- cused on redevelopments, mergers and trades. This isn't a bad thing, if you ask Thompson — at least as far as current players are concerned. "The recent Allen Matkins/UCLA Anderson Forecast noted the continued decline in retail development sentiment," he says. "That could be a good thing for the owners of existing assets. On quar- terly earnings calls, you'll actually hear shopping center REIT CEOs talk about how the low supply bodes well for their repositioned portfolios. They're moving into strong markets, investing heavily in existing assets and benefitting from the relative lack of competition amid this low supply." In today's tech-heavy, efficiency-driv- en environment, sometimes less really is more. SCB Renaissance at Rialto is a 430,000-square-foot shopping, dining and entertainment center in Rialto that is anchored by Cinemark XD and 24 Hour Fitness. The property is owned by Lewis Group of Companies.